"Moist, yellow cupcakes with cinnamon and spice make a great dessert or snack, with or without frosting." Preheat oven to 350 degrees F. Place Reynolds Baking Cups in muffin pans; set aside. Combine ingredients in large bowl. Beat with an electric mixer on medium speed for 2 minutes. Spoon batter into baking cups. Bake 20 to 23 minutes or until wooden pick inserted in center of cupcake comes out clean. Cool on cooling rack. Frost as desired. 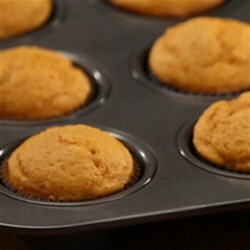 See how to bake moist spiced pumpkin cupcakes in parchment paper cups. To make Parchment Paper Baking cups, cut Reynolds® Parchment Paper into 5” squares and press over the bottom of an upside-down glass. After baking, lift the cupcakes by the parchment edges. Here's a video showing this handy kitchen tip. i realy love this recipe althou i added half tsp of cinnamon and half of ginger and intead of water i added milk and they were delicious and spicey. Love this recipe. Very easy. I used a spice cake mix instead of yellow cake mix. Also have used in loaf pan for pumpkin bread. So soft and yummy, no need for frosting. I love that its such an easy recipe.